The Fountainindividual lighting for most jets, moving spotlights, rain, fog, and many other effects. The feature attraction which they designed was two seven-minute shows, one of which played every hour. 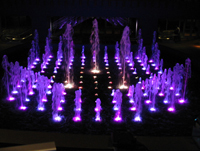 To fill in the remaining majority of each hour, Thinkwell tasked a group of us at the Entertainment Technology Center to design a system to make the fountain interactive in a one-of-a-kind way. Our system, dubbed Splash!, uses a network of overhead cameras to watch people as they walk past the fountain. Under our control, the fountain engages the unsuspecting guests in a variety of games and entertains them with lighthearted mini-shows that we choreographed. After coming up with many, many ideas we, along with our client, narrowed it down to three games to be realized for phase one of this project. Follow MeFollow Me was our introductory individual guest game. 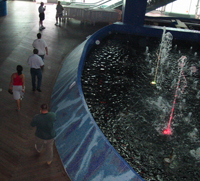 As guests would walk by, the fountain picks up to five individuals and follows them around the space with a uniquely colored jet or water. 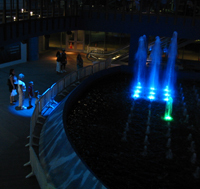 When small groups would gather, the fountain would play a game called Paint the Fountain wherein it would project five different colored spotlights around the edge of the pool and respond with correspondingly colored blasts of water varying in size based on the number of people that would collect in each light circle. This was a competitive game with the goal of creating a larger area of active jets than any other color. Paint the Fountain When the crowd would grow even too big for this game, for instance when people were anticipating another big show, the fountain would play a game that was a take off of the classic Gong Show. The water and lights would spin about and randomly select someone by shining a spotlight on them. The fountain would encourage them to dance and play a short musical selection. The fountain waited and if the chosen guest did not respond the fountain would respond with a disappointed sound effect and find someone else. However, if the person in the spotlight did perform the fountain would reward them with a little show of its own, choreographed to the next few seconds of the song. Although the original design of the games and some prototyping took place during the school semester, the fountain was not ready for installation by our May deadline. Two of us, a designer and me, were hired by Thinkwell to complete the project. From the beginning of June until mid-August we worked in Atlantic City to get the equipment and software installed, test the programming with real water and cameras, performed guest testing, and made appropriate improvements to the games. Because the fountain didn't become operational until mid-June, we needed a way to test how our games would work and what they would look like months before we hung our first camera or poured our first drop of water. Our solution was a combination of 3D visualization and physical mock-ups. To test the expected operation of the fountain I build a 2D visualization of the expected fountain activation. To see what it would really look like, we build a 3D model of the fountain and modified a piece of real-time lighting previsualization package to show us what both the lights and fountains would be doing. To test how the fountain would detect and respond to people, I hung a single camera above a 1/50th scale model of the fountain that other members of the team built and used small model people on stick to simulate our guests. As the technical lead on this project it was my responsibility to devise the system capable of making such a fountain interactive and executing our game ideas. Although I proposed several technologies, I rapidly investigated all of the options and determined that overhead cameras would be the most effective method of supporting the largest variety of games. With that in mind, I helped lead the brainstorming to come up with ideas that took advantage of many different types of behaviors we would be able to identify including position, group size, movement, and activity. I had to spec all the extra equipment needed for our interactive system. This included evaluating different camera alternatives, in the end selecting to go with an experienced vendor capable of providing us with a full system of cameras, capture equipment, and software for processing the raw images before passing them to our software. This saved us a lot of time that we would have had to spend writing our own software to do this that we could instead spend improving the games. PrevisualizationBesides the cameras, our system had to be able to control the fountain and the lights. This meant writing software to interface with a large variety of different hardware devices. Because we were doing something that no one had ever done before, we had make partnerships with the developers of almost every piece of hardware and software we used and work with them to add features that no one had ever needed before. This was the case with our DMX control interfaces, our lighting previsualization software, and our show control programming software. I was also the sole programmer for the project. 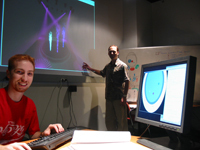 That meant building the computer vision to identify people from a 50 foot overhead view in real time, in addition to programming the games and control systems. I worked hand in hand with a lighting designer who was creating the look of the fountain, a creative consulting helping us test people's reaction to the fountain and improve its personality, and the project management for the fountain at large to interface our system with the system that would operate the show and the games on a daily basis.